Almost all countries, who do research on Antarctica, have some day lost one of their ships. Near the McMurdo Station sank the German "Gotland" in the pack ice and the Australians lost "Nella Dan" near Macquarie. With every naval disaster, even when the ship didn't sank, a lot of oil washed in sea. One of the largest environment disasters happened when the Argentinean "Bahía Paraíso" sank. It's obvious that such spills are a disaster for all life in and around the sea. Oiled penguins aren't able to swim because their "wetsuit" isn't waterproof anymore. When they are forced, by hunger, to enter the water, they will extremely cool off and die. And by cleaning their feathers they get poisoned by the toxic oil too. Because the most research is done during the Antarctic summer, most of those accidents happen then. But it is also the period for penguins to breed, which make them extra vulnerable. 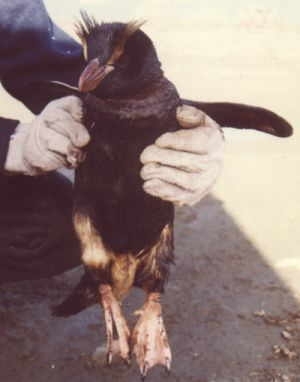 Especially African penguins suffer a lot from oilspill, as they live in South Africa, where many oil tankers passing by. The Treasure sank in the early hours of 23 June 2000 before the coast of South Africa. Oil washed ashore on Robben Island on 25 June and surrounded Dassen Island on 28 June. Dassen Island supports the largest breeding	colony of African Penguins, a species classified as Vulnerable because of a massive decrease in numbers during the 20th century. Robben Island supports the third largest colony of this species. Between them, the two islands support about 21000 breeding pairs, in excess of 50000 adults and 40% of the world population of the species. They tried to evacuate and clean as many penguins as possible, during the whole summer.